← What is neck shape? So what proteins are being talked about here? What do they look like and what do they do? When you Google Papa and concussions and neurotrauma, you get a bunch of research articles which are cited among them, αII spectrin break down products. Next question: what are spectrins? They are parts of cytoskeletal proteins that lines the intracellular side of the plasma membrane of many cell types in pentagonal or hexagonal (5 sided-6 sided) arrangements, forming a scaffolding playing an important role in maintenance of plasma membrane integrity and cytoskeletal structure. 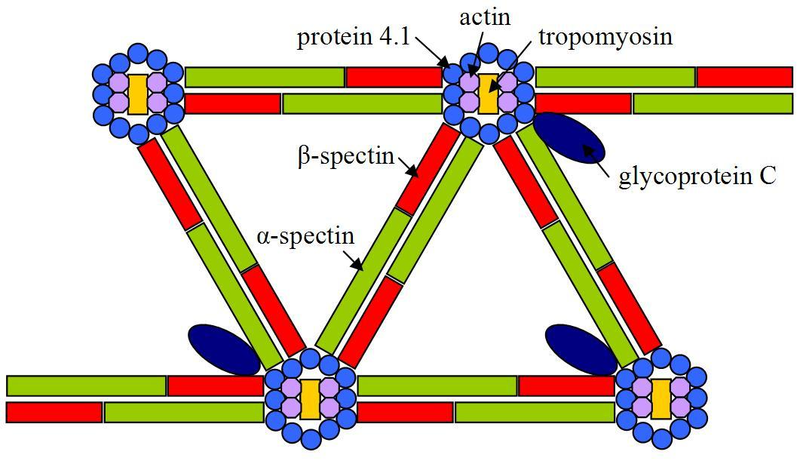 The hexagonal arrangements are formed by tetramers of spectrin associating with short actin filaments at either end of the tetramer. These short actin filaments act as junctional complexes allowing the formation of the hexagonal mesh. In certain types of brain injury such as diffuse axonal injury, spectrin is irreversibly cleaved by the proteolytic enzyme calpain, destroying the cytosketelon. Spectrin cleavage causes the membrane to form blebs and ultimately to be degraded, usually leading to the death of the cell. Let’s look a little at what these proteins accomplish in Nature, let’s look first at invertebrates. There are three spectrins in invertebrates, α,β and βH. A mutation in β spectrin in the worm, C. Elegans results in an uncoordinated phenotype in which the worms are paralysed and much shorter than wild-type. In addition to the morphological effects, the Unc-70 mutation also produce defective neurons. Neuron numbers are normal but neuronal outgrowth was defective. Similarly, spectrin plays a role in fruit fly Drosophilia neurons. Knock-out of α or β spectrin in D. melanogaster results in neurons that are morphologically normal but have reduced neurotransmission at the neuromuscular junction In animals, spectrin forms the meshwork that provides red blood cells their shape. So notice the terms that are referenced here like: meshwork, morphological effects, outgrowth was defective, reduced neurotransmission at the neuromuscular junction, diffuse axonal injury and destroying the cytoskeleton. Now I can’t put words into people’s mouths but as I have mentioned in previous essays, meshlink communication is all about how cells fashioned in tensegrity designed architectural shapes use and define their cellular configurations within shape altering interactions as deterministic cellular signalling. Shape shifts happen during protein interactions. If you severe the structure if you crush the mesh- the system will degrade in its output. So to give a different orientation with to-days announcement about biomarkers, concussion depending on its severity will have bits of the meshlink from diffuse axonal separation available as bits of the structure, detectable in serum, or within a blood sample. So what is a concussion? It is a massive shape altering jarring cytoskeletal severance of multitudes of attachments depending on the zones of attachments within the mesh that connects everything together in the brain. It’s an infrastructure crash of the elements that are like a city shaken during a earthquake, parts of the structure detach. It’s those detached parts that Dr Papa is finding and calibrating with the damage. I hope this different tensegrity view gives you an alternate window to look onto the ripples of a concussion affecting brain integrity following a concussion.